Last week we covered the IRR function, which enabled us to calculate the Internal Rate of Return of a project. 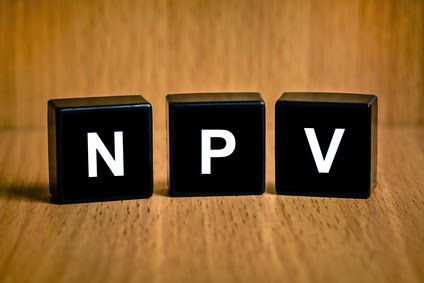 This week I am going to introduce the NPV function which allows us to calculate Net Present Value - a function closely related to IRR. The Net Present Value of a series of cash flows, gives a value of those cash flows today discounted by a required rate of return. The required rate of return represents represents the investor's time value of money. This is often the rate of return achievable in alternative investments. and we require a 10% annual rate of return. where rate is the required rate of return and value1, value2, etc. are a series of cash flows at the same regular interval as the rate, so if the rate is an annual rate, then the cash flows should be a year apart. value1 is required, whereas [value2] onwards are optional. These can be entered as values or refer to a range. Note that these cash flows are assumed to be at the end of each period. Obviously, we would normally also refer to a cell to provide the rate as well, rather than enter it directly into the formula. Excel is best source to store data & files. I am sharing top essay writing services site.